GeoSierra has pioneered the propagation of vertical inclusions in ductile formation using non-invasive fluids. Since our inception, we have strived for better, more efficient and robust stimulation methods. The recent advances in the split casing system for oil and gas applications shows this commitment. 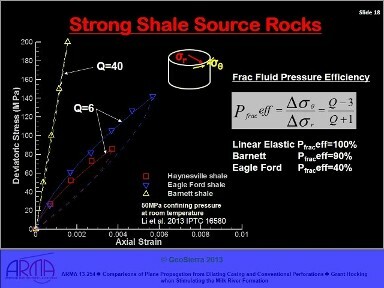 The offset well comparison at depth in the Milk River tight gas reservoir clearly demonstrated that conventional hydraulic fracturing does not excite the least energy dissipating mechanism in ductile formations, and either leads to cavity expansions in weak formations, or short horizontal inclusions in stronger formations, contrary to the prevailing in situ stress state. The offset split casing stimulations produced long vertical inclusions at all horizons. View the Presentation given at the 47th US Rock Mechanics Symp in San Francisco. GeoSierra introduces the Azi-Frac™ technology, an azimuth controlled well stimulation process for installing vertical planar inclusions in weakly cemented formations on particular azimuths from either a horizontal or vertical well. The technology was developed from GeoSierra’s earlier groundwater remediation PRB expertise, enhanced in a joint collaborative effort between Halliburton and GeoSierra called X-Drain™, and now recently refined and extended to provide the technology in either a horizontal or vertical well for oil field applications. View GeoSierra’s History and Development to see how the technology has evolved. The Azi-Frac technology involves initiating a vertical fluidized plane on a particular azimuth to form a preferential direction for the injection and propagation of the inclusion from the wellbore. The injection process is not a fracturing mechanism, and is not applicable to hard brittle rock, instead it creates a self propagating inclusion on azimuth in weakly cemented formations. For horizontal well initiation, an Azi-Frac open-hole stimulation tool dilates and creates an extension zone in the formation, creating a vertical fluidized plane orthogonal to the wellbore axis for inclusion injection and propagation. In a vertical well, Azi-Frac casing segments are cemented in the well, then mechanically expanded to split the casing and cement along pre-aligned vertical planes, with each propagating vertical wing of the completion stimulated independently by the treatment tooling. Field trials of the technology have demonstrated that on azimuth, vertical, permeable planes can be constructed from a single well down to depths exceeding 500m. The technology is not depth limited. 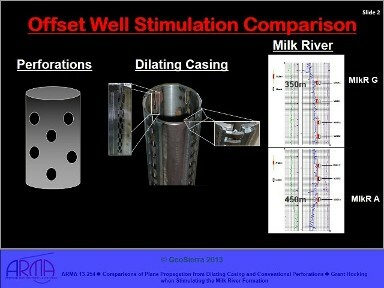 A retrofit system for stimulating very deep existing vertical wells is expected to be ready for deployment by mid 2015. Azi-FracTM – is a trademark of GeoSierra LLC. X-DrainTM – is a trademark of Halliburton.